Ok for those out there that are still way behind on moving to Team Foundation Server and still use SourceSafe, you will find adding solutions to it in VS.NET 2010 is not enabled by default. To switch source control providers back to SourceSafe do the following: Goto 'Tools' -> 'Options' and select "Show all settings". Expand the "Source Control" node and then select "Plug-in Selection". 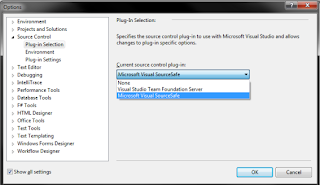 On the right hand side change the value in the "Current source control plug-in:" to "Microsoft Visual SourceSafe" (pictured below). Then sometime soon consider moving to Team Foundation Server, which has a "Basic" version that allows a route into a new provider for those intimidated by switching away from SourceSafe. Recently I had the need to get a new list of objects that results in a new list with all of the items in 'MyList1' that don't already exist in 'MyList2'. At 1st glace I thought I could use the Enumerable.Except function to accomplish this. However I soon came to realize that if the class representing this list has 10 properties, all 10 properties are checked to find the difference. This does make sense and works as intended, but in my case the results were not what I wanted because one of the properties was a timestamp, and even though an object in MyList1 had the same 'ID' as an object from 'MyList2', its timestamp property was different thus retuning that object into the new list as well. What I needed to do was base the returned list results on a single property: 'ID'. This is all that I cared about, so the default overload of the .Except method of an IEnumberable type was not going to work. So the above code can loosely be read from the inside out as "Select all IDs from MyList2 that do not exist in MyList1 and return them into a list of type MyList1". The .Where() method returns the elements from source that satisfy the condition specified by predicate. A predicate is a function that will test each element for a condition returning a Boolean value. In our case the Boolean value returned is True/False if the .ID in MyList2 exists in MyList1. Also notice the .Select() method called on MyList2 to project over the sequence of .ID values and use the index of each element in the projected form. Both IQuerable methods define an Anonymous method in VB.NET using the 'Function()' keyword accepting parameter of the type to be used. In our case the .Where() method takes the anonymous type 'i' which is of type MyList1 and the .Select() method takes an anonymous type 'i2' of type MyList2. If we were to decompile the above code we should see all of the values in MyList2 being iterated over to determine if the .ID value already exists in MyList1 and if not adding it to a new list of type MyList1 that is the result. Just remember that Lambda expression are just syntax sugar. In our case you could write the same code long hand by defining a delegate method that takes in the list types and iterates through them to get the same result. The Lambda expressions make our life as developers much easier by not having to write out so much code. Even though LINQ should not be confused with TSQL, the above query does have attributes of a typical SQL query. It is essentially a 'NOT' clause with LINQ sprinkled in. It reads loosely as follows: "Select all of the items in MyList2 that are also in Mylist1, and exclude these items (using NOT) from everything that is in MyList1; finally Select the results. I think another advantage of this is it is faster to modify if you needed to make the comparison based on (2) properties as opposed to (1) as in my examples. Both solutions work identically and will produce the same results. So to review, we discussed (3) methods for comparing (2) lists to get only the items in the 1st list that don't exist in the 2nd list: the Enumerable.Except() method, the Queryable.Where() method, and a LINQ query. Each has their place, but all will help to quickly make a comparison that otherwise may have required a long had For-Each loop with a flag set for comparison differences in order to get the same result. The Object Data Source control is a nice way in ASP.NET webforms to bind a GridView control to a business object. It helps organize the method calls and events associated with the object and does save a lot of coding that must otherwise be done manually. Another benefit of binding a GridView to an ODS is that it will automatically create all of the bound columns in your GridView based on the properties on the object. So in the class below, FirstName, LastName, and Address will be displayed in the GridView. One last point to mention is concerning the ODS control. This post syntactically and programmatically is the same for those of you that manually bind a GridView control and do not use an ODS. The main elements here were the type of column used 'TemplateField' and the Data-Binding expressions 'Eval()' to access the child object's properties.